Easy roasted acorn squash recipe topped with an utterly delicious mixture of butter, walnuts and cranberries. 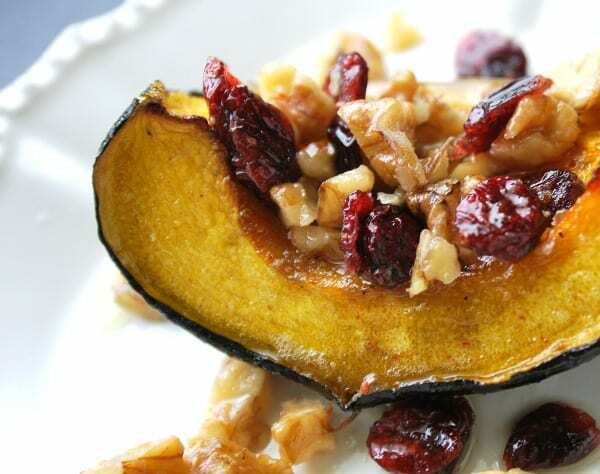 Jump to the Roasted Acorn Squash with Walnuts and Cranberries Recipe or read on to see our tips for making it. We love this roasted acorn squash recipe. It’s easy. Simply cut the squash into wedges the brush with olive oil and season with brown sugar, salt and pepper. Bake for about 1 hour then serve the roasted squash with a mixture of melted butter, walnuts and cranberries spooned on top. For more easy winter squash recipes, check out our Cinnamon Roasted Butternut Squash, our Parmesan Lemon Baked Spaghetti Squash with Chicken, Easy Roasted Butternut Squash Soup and our Homemade Pumpkin Puree Recipe. If you try this recipe, let us know! Leave a comment, review it, and don’t forget to tag a photo #inspiredtaste on Instagram. Happy cooking! 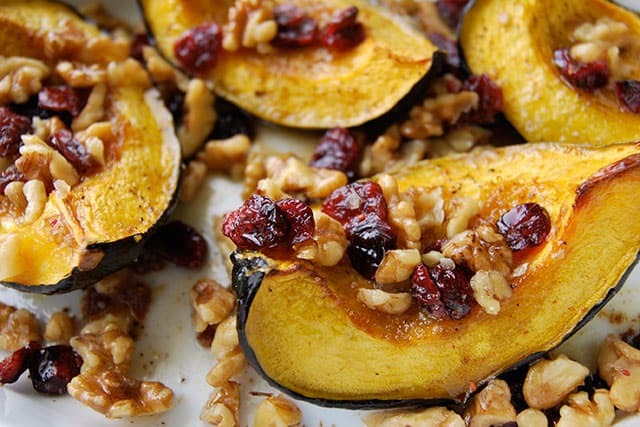 Roast acorn squash in the oven and top with butter, crunchy walnuts and sweet cranberries. It’s stunning on the table and everyone’s loved it. 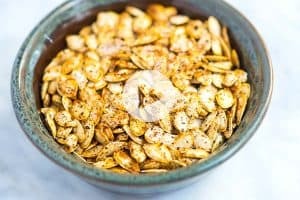 Cut squash in half and use a spoon to scoop out all the seeds from the middle. Carefully cut each half into 2 wedges. Place the wedges into a large baking dish then brush all sides with the olive oil. Scatter the brown sugar evenly on top then season with salt and pepper. Bake until soft and caramelized around the edges, about 1 hour. When the squash has roasted, add the butter, walnuts and cranberries to a small saucepan over medium heat. Cook until the butter begins to bubble around the nuts then spoon over the squash. Silly question…..do I place the squash with the cut side facing up or down. Thank you as this sound delicious! Both will work, but in our photos, we have cut-side facing up. Greetings! I purchased acorn squash in November for Thanksgiving but, they didn’t reach the dinner table. Christmas was upon us, I made Acorn Squash Bread, and saved the seeds. In April I put the seeds in the yard for the birds. In return I got several squash plants. In June the plants began produce. This Roasted Acorn Squash w/walnuts and cranberries made it to dinner table four times in four weeks. Delicious and so easy. We all loved it. Five Big Stars. I have all ingredients, except Walnuts! Would you make it with only cranberries, or roast with butter and the brown sugar only? The squash will be great with the cranberries, butter and brown sugar. Hello. This looks perfect for my vegetarian Thanksgiving. Dumb question… & I pray you can answer quickly, because it is Thanksgiving Eve!… is the “shell” of the squash edible?? I’ve always assumed it’s not! The photo appears to include the rind. Please reply! Thank you. Hi Lynn, the skin is definitely edible but depending on who is eating it they may prefer to leave the rind on the plate. Is there anyway to make ahead? Hi Rebekah, Yes, this can be made ahead of time then reheated before serving. You might want to roast the squash ahead of time then make the butter-walnut mixture just before serving. 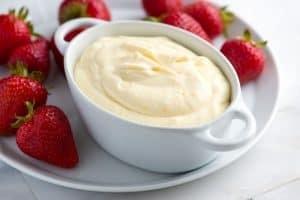 Any suggestions on a substitute for the butter on the topping for allergy/intollerence for milk? Coconut oil, walnut oil or an olive oil would be nice. Earth Balance vegan ‘butter’, for the butter flavor, might work also. I baked the squash in my convection oven and the halves were tender in 35 mins. Added a little fresh parmesan on top which gave a nice salted contrast to the sweetness. Great recipe. It’s hard to find vegetarian dishes for one. 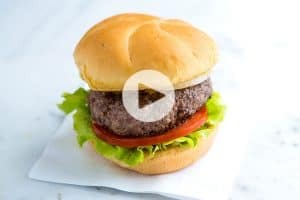 This recipe was perfect for me and I got two meals out of it! It was more delicious than I had expected it to be. Thank you so much! Just made this for dinner! Eating is as I’m typing! SOOO good. I’ll have to double or triple this recipe for thanksgiving. what would that do to the cooking time? Hi there! As long as you keep the squash in one layer, the cooking time should be about the same. If you are using two baking sheets/two oven racks, you might want to rotate halfway through cooking to make sure they cook evenly. Alright, I don’t care what time it is. I’m headed to the store to get the squash and cranberries, the rest I have. And they have an apple cinnamon marinated pork loin at the store that I think will be perfect….YUM! Awesome! This would be perfect with the apple cinnamon pork loin! Hmmmm – this looks glorious! Sounds delicious Judith, let us know how things turn out! LOVE your photos.. absolutely beautiful! You have inspired me.. I am going to follow your recipe.. ‘bake the squash as you say.. but add my ‘fruit/sugar’ concoction to it, whilst it bakes for an additional 15-20 min. If we don’t have squash here in Thailand, do you think that I can use pumpkin instead? They look pretty similar. Although we have never tried it with this recipe, we think pumpkin would be a great replacement for the squash. The roasting time may be a bit different, but I think it is definitely worth a try! Let us know how it goes. Oh I love acorn squash. It looks like this recipe turns them into acorn squash candy! wow…what a fabulous combo of flavors…and great photos. YUM! This looks delicious. I love baked acorn squash. This looks like a recipe I may use for Thanksgiving! OH YUM, this sounds so good and healthy. wow I so want a bite of that! Acorn squash, roasted and served simply with butter, salt and pepper and a side of wilted kale is one of my favorite fall dishes. But I’m all for gilding the lily every now and then. Might even tempt some of the squash-averse members of my family. Gorgeous photos!